American architect. The son of a prosperous box manufacturer in Rhode Island, he had a strict, religious and inhibiting upbringing that took some years to outgrow. He was educated locally, taking a first degree at Brown University, Providence, RI, before proceeding in 1899 to the architecture school at the Massachusetts Institute of Technology, Cambridge. In 1901 he joined the office of Cram, Goodhue & Ferguson, where he absorbed from Bertram Grosvenor Goodhue a feeling for the Gothic tradition in American architecture, which was to be an important supplement to his grounding in Beaux-Arts Classicism. In 1904 he went to study in Paris, enrolling in the Atelier Duquesne at the Ecole des Beaux-Arts. He spent much of the next seven years in Paris or travelling in Europe, apart from an interlude in 1906–8 when he worked in Pittsburgh and New York for his friend Henry Hornbostel (1867–1961). During this period he developed into a sharp, confident, ambitious, worldly and entertaining young architect of much potential, but with a conventional Beaux-Arts approach to style and planning. His early projects are impressive chiefly for their balance of Gothic and classical vocabularies. Returning to the USA in 1911, Hood at first made slow progress. He worked for others, mainly for Hornbostel in Pittsburgh, before opening his own office in New York in 1914. His early practice and habits were mildly bohemian, earning him a certain regard but little remunerative work. Mori’s Restaurant in Bleecker Street demonstrated Hood’s abilities as a decorator and colourist, while the merry, boat-shaped swimming pool and pavilion (1920) to the Crimmins house, Darien, CT, revealed a gift for architectural display, fun and irreverence, which never deserted him. Hood’s two later Rex Cole showrooms (1929–33) at Bay Ridge, NY, designed in the guise of refrigerators for a salesman of the product, are among the better architectural follies of the 20th century. The turning point of Hood’s career was his triumph in the Chicago Tribune competition of 1922, with a design for a Gothic tower (see Competition, fig. 3). He submitted the entry in conjunction with John Mead Howells, but Hood was responsible for its development and detailing. The Chicago Tribune Building led to the four great skyscrapers in New York on which Hood’s fame rests: the American Radiator Building (1923–5), the Daily News Building (1929–30; see fig. ), the McGraw-Hill Building (1930–31; see Building regulations, fig. 3) and the RCA Building at Rockefeller Center (1931–40; for illustration see Rockefeller). All these buildings were designed in collaboration with his partners Frederick Godley and J. André Fouilhoux (1879–1945), sometimes also with other architects (Howells at the Daily News Building, and two separate teams at Rockefeller Center). He excelled at this style of modern office building, and was able to stamp his individuality on each project. In this sequence Hood exploited to the full the architectural opportunities provided for the high-rise building by the New York zoning law of 1916, progressively simplifying and refining his compositions. Working habitually from clay models, he pared down the ornament of the skyscraper, substituting a counterpoint of dramatic, colourful and subtly proportioned planes and masses. This gave the later buildings, especially the green-glazed McGraw-Hill Building, a seemingly ‘modern’ flavour. Hood, however, developed a distinctively American style, owing little to the European modern movement. His urban architecture is expressive, extrovert and alert to the image-consciousness of modern commerce. The unique black and gold of the American Radiator Building, symbolizing coal and flame, is the most explicit example of this; Ideal House (1929), London, a smaller and simpler building for a subsidiary of the same company, displays the same livery. Yet his architecture was also sternly practical and disciplined. As an urban planner he acknowledged the demand for maximizing rentable space and concentrating services. The varying sculptural and structural forms of his completed buildings sprang straight from this necessity. Hood’s skyscrapers are never coarse, lumpy or dependent on Art Deco ornament, in contrast to other skyscrapers in New York of the years between the two World Wars. A feeling for Gothic proportions and massing, crucial to the aesthetic development of the high-rise building, persists even in the Daily News and RCA buildings with their truncated tops, and this singles Hood out as the architect who did the most to develop American Gothic. 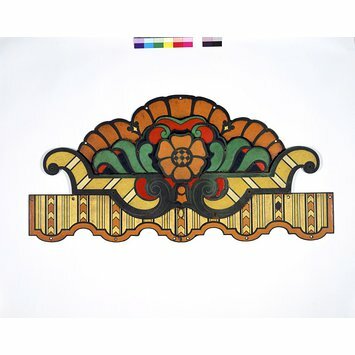 Enamel on Bronze, Birmingham, 1928, Birmingham Guild of Handicraft, designed by Raymond Hood for Ideal House, Argyll Street, London W1. A. Trystan Edwards, "The Clash of Colour or the Moor of Argyll Street" in Architectural Review, Vol LXV, January - June, 1929, pp.289-99 ill.
Andrew Saint, " Americans in London, Raymond Hood and the National Radiator Building" in AA Files No.7, September 1984, pp.30-43, ill.
Tim Benton, "Art Deco Architecture" in Art Deco 1910-1939, ed. Tim Benton, Charlotte Benton and Ghislaine Wood, London , V&A, 2003, p.256 ill.